Bruce matriculated in 1960 from K.E.S and enrolled at the University of Pretoria for Veterinary Science. He graduated in 1965 and joined Sandown Veterinary Hospital as an assistant running the after-hours emergency service. Travelled and practiced in Ireland and Britain during 1967 including a few months at Cornell University. On returning to RSA he joined Dr. G Frost in Randburg. He decided to start his own small animal high-quality practice with his brother Craig who qualified a year after him. The current building was completed and opened in 1970. Dr. Bruce Irvine-Smith acquired his small animal specialist surgeon qualification in 1976. The practice grew steadily over the years and with additions to the original building and vast improvements in facilities, equipment and services, it now offers a modern well equipped small animal first opinion and referral veterinary service with a staff of 12 veterinarians providing a 24-hour service. Remo graduated in 1987 with a BVSc degree. He spent the next 2 years in the Veterinary section of the South African Defense Force. Then in private practice for 2 years at Orange Grove Veterinary Hospital in JHB. He joined the Department of Medicine, Faculty of Veterinary Science, University of PTA, as a senior lecturer in 1992 and was promoted to associate professor in 1997. From 1997 -2000 he was Section Head of Small Animal Medicine at the Faculty. 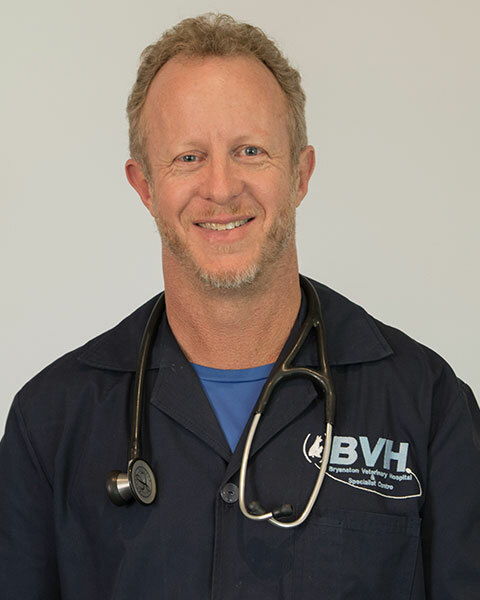 In 2001, he moved to Bryanston Veterinary Hospital as a specialist physician. Greg graduated from the Faculty of Veterinary Science in Pretoria in 1993. Received a clinical medal at the end of his final year. He then spent 5 and a half years working in the UK, including 1 year in mixed practice in Wales, the rest of the time in small animal practice in London and Berkshire. He returned to RSA in December 1998 and joined Bryanston Veterinary Hospital. 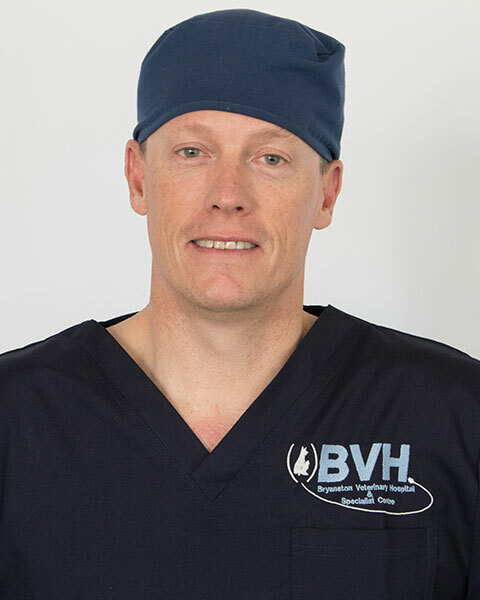 Dr Greg Irvine-Smith completed his MMEDVet (Small Animal Surgery) degree in 2009. His interests include orthopedics, arthroscopy and spinal surgery. Outside of work he enjoys cycling and the outdoors. 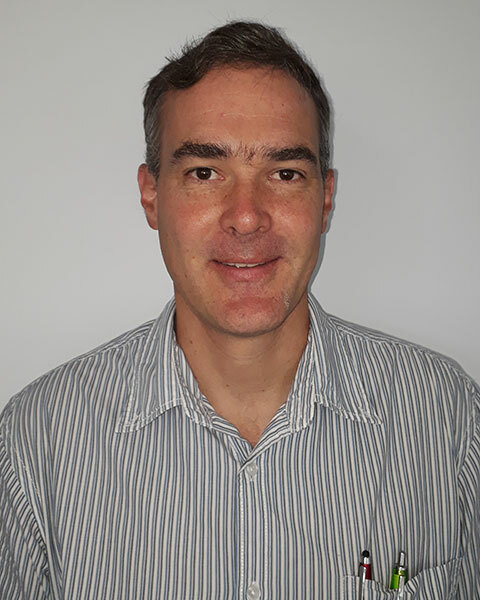 Chris qualified with BVSc from the Faculty of Veterinary Science at Onderstepoort in June 1993. He worked as a small animal vet in Southend, Essex, Uk from November 1993 to June 1995 and then moved to Farnham, Surrey where he worked until August 2000. 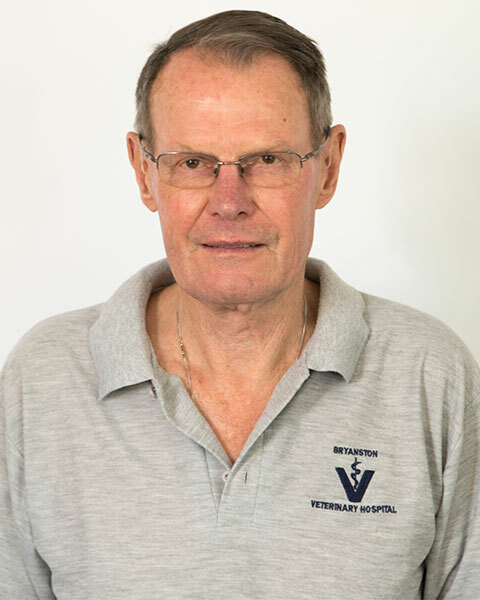 He started at Bryanston Veterinary Hospital in September 2000. Did his BVSc Hons (main subject small animal medicine and ophthalmology) at Onderstepoort in 2003. He is married and has 3 beautiful children. They have 2 dogs, a cat, lots of fish and 4 chickens! They love travelling, wildlife, photography and the outdoors. 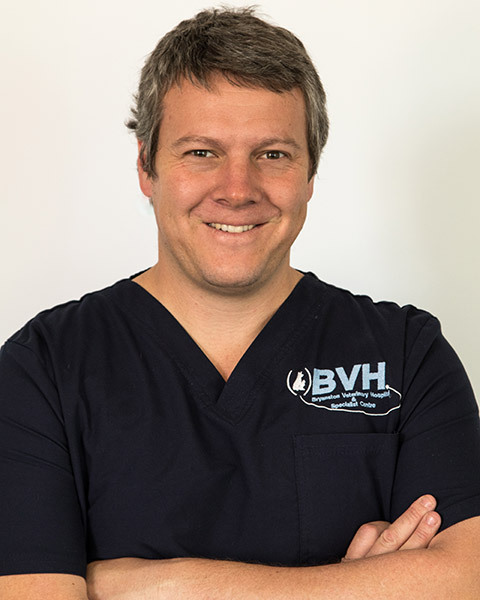 Ross qualified with BVSc from the faculty of veterinary Science at Onderstepoort in 2005. He started working at Bryanston Veterinary Hospital after qualifying and immediately began he MMed Vet (Small Animal Surgery). He completed his MMed Vet in 2012. 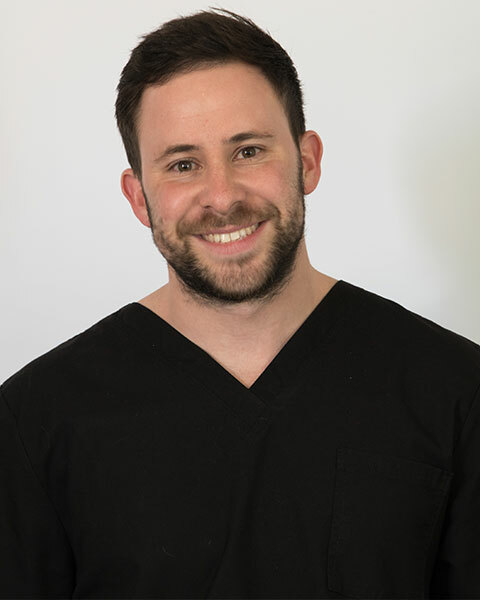 Ross has a special interest in soft tissue and neuro-surgery. He is a keen runner and has completed the Two Oceans and Comrades marathons. His other interests include water polo and visiting the Kruger National Park. Kenneth graduated with a BVSc from The University of Pretoria in 1995. After graduating he joined small animal practice in Johannesburg for 2 years before returning to the University of Pretoria. 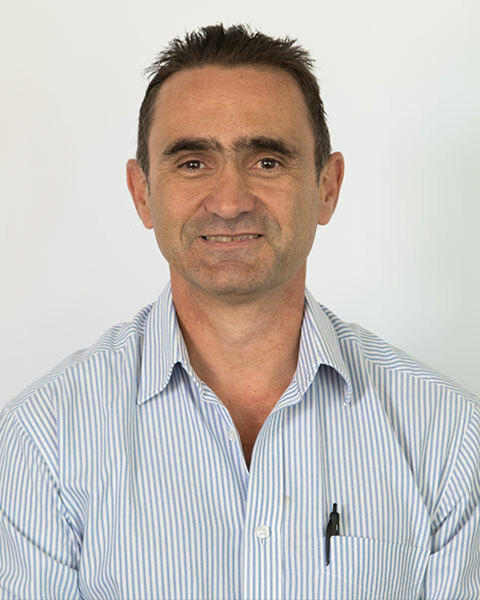 In 2000 he obtained a MMedVet (Anaes) and held the position of senior lecturer in anaesthesiology at the university. 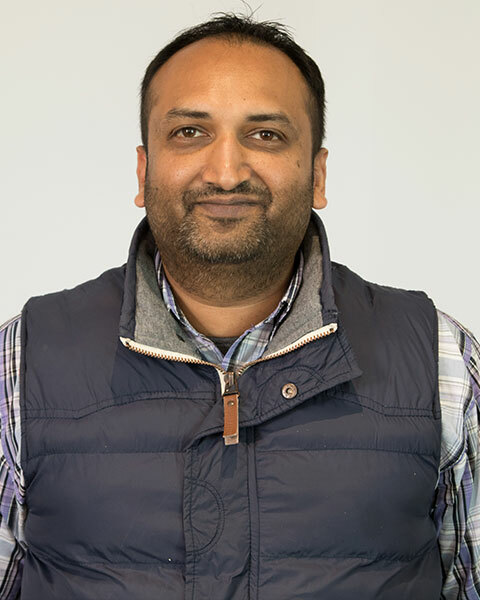 In 2004 he left the university to re-join private practice before starting his own referral practice in anaesthesiology, pain management and critical care. Kenneth runs Veterinary Anaesthesia, Analgesia and Critical Cares Services, a practice dedicated to anaesthesia, pain management and intensive care of small animal patients. Kenneth has a keen interest in total intravenous anaesthesia, intensive care, ventilation and cardiology. His research interests included non-steroidal anti-inflammatory agents, anaesthetic depth monitoring and total intra-venous anaesthesia. Chad finished his BVSc degree in 2014. He joined BVH in 2015 where he completed a rotating internship in medicine and surgery. Chad then finished his honours between 2016 and 2017. After completing his honours, he started specializing in internal medicine in 2018 registering for both national and European accreditation. His major interests are in Endocrinology, cardiology and oncology. Outside of work he has 3 dogs and one cat, his passions are music (especially live rock concerts) and football, supporting the greatest soccer team on Earth -Liverpool. Kathleen graduated from the Faculty of Veterinary Science in 2010 and worked in Welkom & Virginia for 5 years. 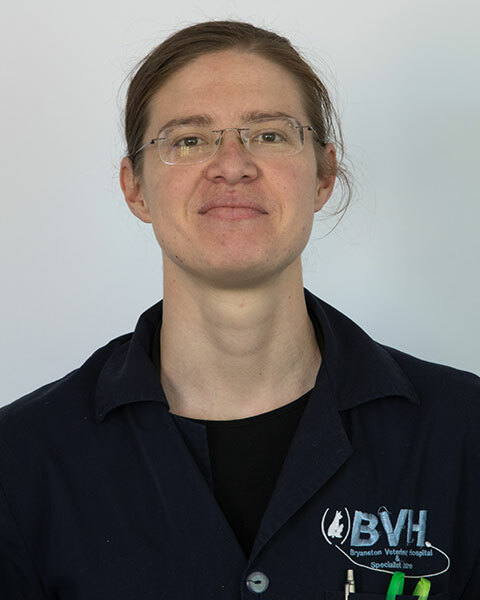 She joined the BVH team in 2016. She is an avid motorcyclist. Elge qualified in 2012 from the University of Pretoria, after which she did her internship at Onderstepoort in 2013. She worked in Hilton for two year before joining the team at BVH. She finished her Honours in 2015 and is currently studying towards her MMedvet in surgery. Outside of work, Elge loves anything to do with adventure, sport and travel. Darshak qualified from Onderstepoort in 2005. After qualifying he moved to Hillcrest, Durban where he worked for 4 ½ years. He then moved to Essex in the UK to work in a small animal practice in Chelmsford for 1 ½ years. He joined BVH in November 2013. He has two wonderful boys, 3 dogs, as well as a keen interest in cricket, golf, squash and food. 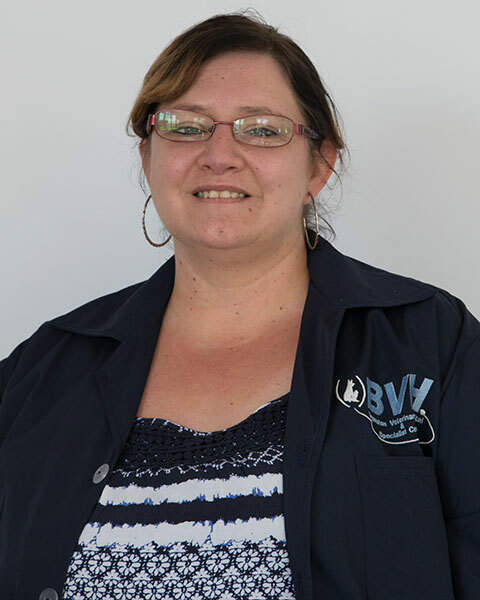 Michelle obtained her BVSc degree at Onderstepoort in 2010. She started working at the Greenside Animal Hospital in Johannesburg after qualifying. Michelle joined BVH in 2017. Her interests include small animal emergency and critical care, soft tissue surgery and dental care. Outside of work Michelle loves spending time with her family and pets. She enjoys walking, cycling and gardening. Dr. Luzanne van der Laan realised her dream of becoming a Veterinarian. She completed her BVSc studies at the Faculty of Veterinary Science at Onderstepoort, in 2016 with distinction. 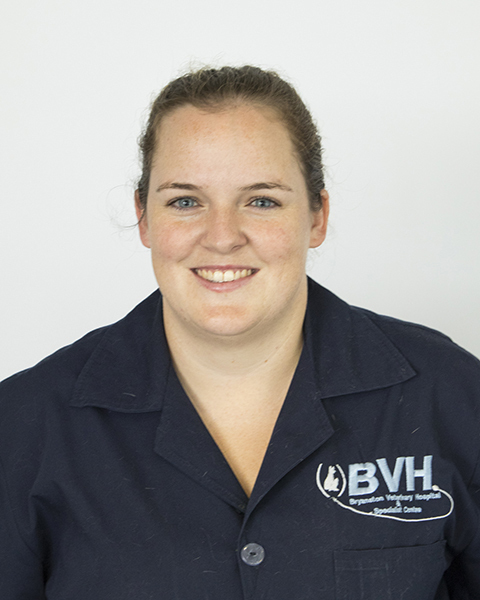 In 2017 she completed her Compulsory Community Service at Temba Animal Clinic, Hammanskraal and in 2018 she started her Internship at BVH, in 2019 she joined the BVH team as a full-time employee. She is currently furthering her knowledge and skills with post-graduate studies at Onderstepoort and she is passionate about the welfare and care of her patients which form part of your family. Rochelle Wilson graduated from the University of Pretoria in 2016, with a distinction in Veterinary Science. She completed her community service year facilitating in import- and export of animals. Since then joined Bryanston Veterinary Hospital beginning of 2018. Rochelle is now part of BVH’s night team staff. Outside of work she enjoys being active, is nature-loving, loves travelling and outdoor activities. 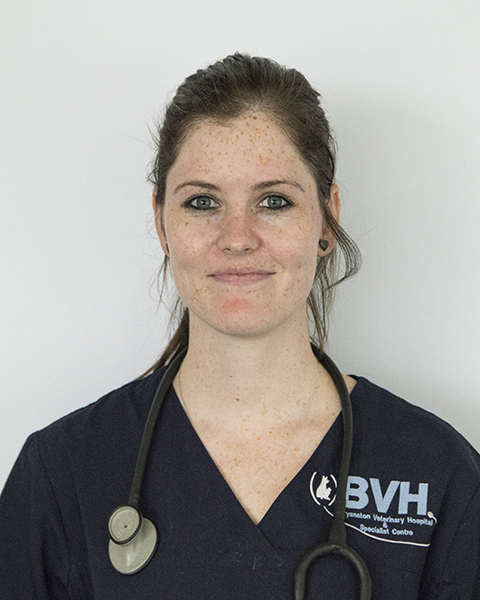 Jandré qualified with BVSc from the Faculty of Veterinary Science at Onderstepoort in 2017. He completed his Compulsory Community Service year in 2018 at Themba Animal Clinic in Hammanskraal. Jandré likes to spend his time outdoors as well as staying active with a keen interest in running and cycling. He also has a tabby cat named Oliver. Tara obtained her CA(SA) qualification in 2002 and her CFA charter in 2006. After working in the finance world for number of years she changed her profession. Tara completed her community service in 2016 and started as an intern at BVH in 2017. She spent 2018 working at a non-referral practice and returned to BVH in 2019. Jayde qualified as a veterinarian from the Faculty of Veterinary Science at Onderstepoort in 2017. Before deciding to follow her passion, Jayde obtained a degree in Economics from Wits University in 2011. She has always had a love for small animals and is so excited that she gets to work with these special animals on a daily basis. When not at work, Jayde enjoys spending time with her family (both human and furry), loves to travel and soak up the sun. Jothie completed her BVSc degree at Onderstepoort, Faculty of Veterinary Sciences in 2014. 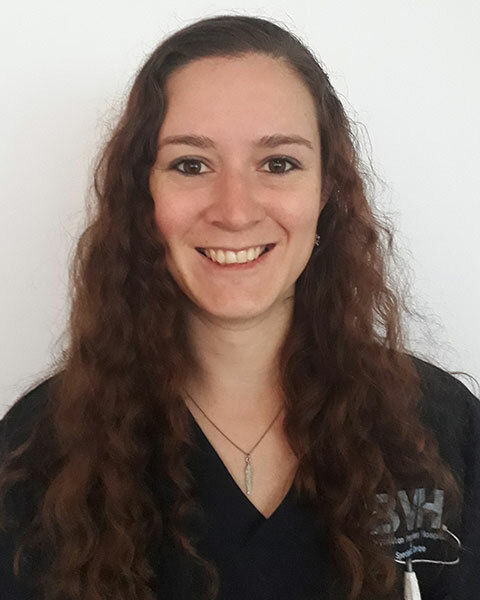 Since graduating, she worked both in welfare (at the Roodepoort SPCA) and private practice and joined the BVH team in November 2018. Outside of work, Jothie enjoys spending time with her dog (a mixed breed rescue), family and friends. She also loves travelling, music, park runs and yoga.